All aboard! Click here to play! 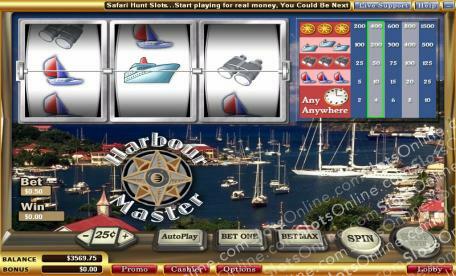 Become a Harbour Master in this fabulous 3 reel game and you will take to the sea in expensive yachts and ships! Plus, if you can spin the reels just right, you’ll also find yourself pocketing quite a bit of cash! As the Harbour Master, you’ll want to take the helm and guide the boats safely through the waters. Do this by spinning in as many golden helm symbols as possible as they will earn you a top payout worth up to 1500 coins. You’ll also need to know how to handle the big cruise ships. Spin these massive boats across the line and you’ll get up to 500 coins. Don’t forget your binoculars. These optical aids fetch up to 125 coins if you can spin three of them across the single payline. Also watch out for sailboats. These will get you up to 25 coins. Plus, a compass anywhere on the board will also payout. Do you have what it takes to be the Harbour Master? Spin the reels to find out and you might just walk away with a small fortune.